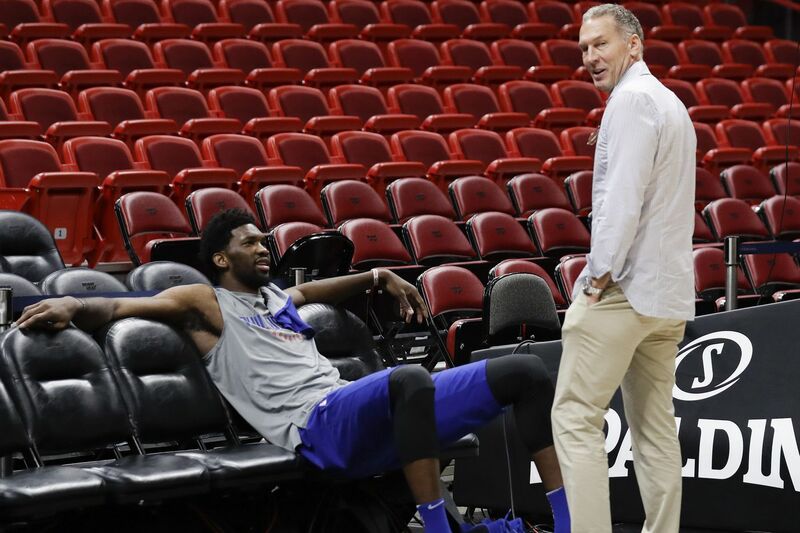 Philadelphia 76ers center Joel Embiid with former team president of basketball operations Bryan Colangelo before a practice in Miami this past April. In a Players Tribune essay published Friday, 76ers center Joel Embiid detailed his origin story by saying, "My life is a movie." Emphasizing how little he knew before moving from Cameroon to play high school basketball in Florida, Embiid described his first practice and the ridicule that came with it. "I was so bad that the coach kicked me out of the gym," he wrote. "I didn't know what I was doing. I was so skinny, so soft. But the worst part was that all my own teammates were seriously pointing and laughing at me." Embiid went on to say that he thought about giving up basketball completely. But by tapping into his competitive side and watching a lot of videos he opened up his game. What kinds of videos? Hakeem Olajuwon, but also, as he put it, "white people shooting 3 pointers." "Those are the guys I learned from on YouTube," Embiid wrote. "Just random people shooting threes with perfect form." Other interesting anecdotes include sneaking away to play soccer after school, getting laughed at by the Kansas women's basketball team, and listening to Lil Bow Wow as one of his first exposures to American culture.